A biographical article about Franklin H. Westervelt in Wikipedia. A biosketch for Frank in the People section of the MTS Archive (this web site). Frank's Obituary in the Ann Arbor News, 3/26/1930 - 7/29/2015. Frank's Obituary in the Ann Arbor News, 31 July 2015. Dr. Franklin Herbert Westervelt passed away on July 29, 2015. He died peacefully at his Ann Arbor home, attended by his daughter, Wendy, his caregiver. He was born in Benton Harbor, MI, on March 26, 1930, the son of Herbert Oleander Westervelt and Dorothy Ulbright Westervelt. Franklin received degrees in Mathematics, Mechanical and Electrical Engineering from the College of Engineering at the University of Michigan. 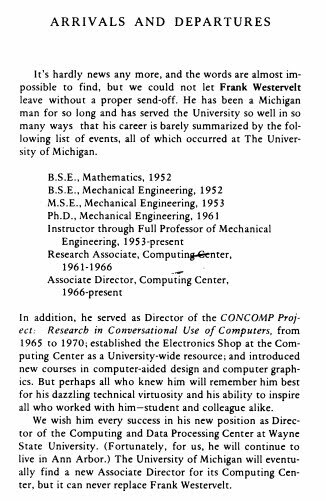 He attained his PhD in 1961 and was an Associate Director of the U of M Computing Center. He was a professor of Electrical and Computer Engineering at Wayne State University, where he served as Director of the Computing Center and Chairman of the ECE department. He was part of the team that developed the MERIT network, linking computers at U of M, MSU and Wayne State University, an early "internet" between the three state universities. Franklin was a wonderful husband and father. He was a master of home projects from decks and boathouse doors to swing-and-slide sets and sandboxes. He also supported strongly the family wildlife sanctuaries in both the Ann Arbor and Traverse City areas, and devoted many weekend hours improving and enjoying them. Franklin is survived by his son and daughter-in-law, Andy and Linda (McCarren); their four children Renee, Eric, Laura and Peter; his daughter, Wendy; his nephew and his wife James and Aida (Datuon) Ednie; and his faithful Lhasa Apso, Merlin. Franklin was preceded in death by his loving and beloved wife of 65 years, Louise (Andrews) Westervelt; his sister-in-law and brother-in-law Frances (Andrews) and William Ednie, and one niece Linda Ednie. August 02, 2015: I worked with Frank for many years at the UM Computing Center where he was a good friend and a great role model. 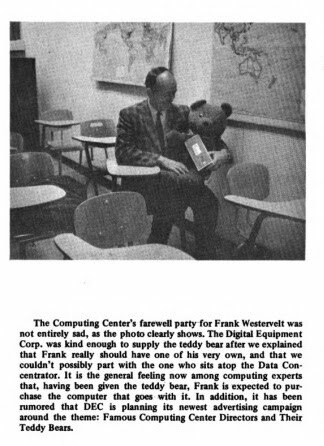 He had far more influence on the success of the Computing Center in the 60s and 70s than most people realize. We will all miss him. --Mike Alexander, Ann Arbor, Michigan.